On Sunday she's running for a greater purpose. Nine-year-old Siena first became aware that there are people in the world who struggle to meet their most basic needs when she learned about the Azawak region as a first-grader participating in Amman Imman's Wells of Love program. Along with her classmates at the Oneness-Family School, she became very concerned that children in the Azawak hardly had a glass of water to drink, and were forced to spend their time searching for this most essential resource. Through the school's annual Amman-a-thon, a fitness philanthropy activity that raises funds as students improve their athletic skills, she had the practical experience of turning her concern into action. Together the students in Siena's class raised around $3,000 by jumping rope, shooting baskets, hula hooping and other fun activities. But it wasn't enough for Siena. Determined to make even a bigger difference, Siena and her sister Aria organized a lemonade stand in front of their home to continue helping raise funds for water. That year the funds Siena, Aria and their classmates raised went towards Amman Imman's borehole and community activities in Ebagueye. Siena did not stop there. When her family moved to California, Siena determined that she wanted to bring Amman Imman to her new school. With help from her mom, Siena made a powerpoint presentation and shared it with her 2nd grade classmates. Now Siena is springing into action again. On Sunday August 11 she'll once again use her skills to make a difference. 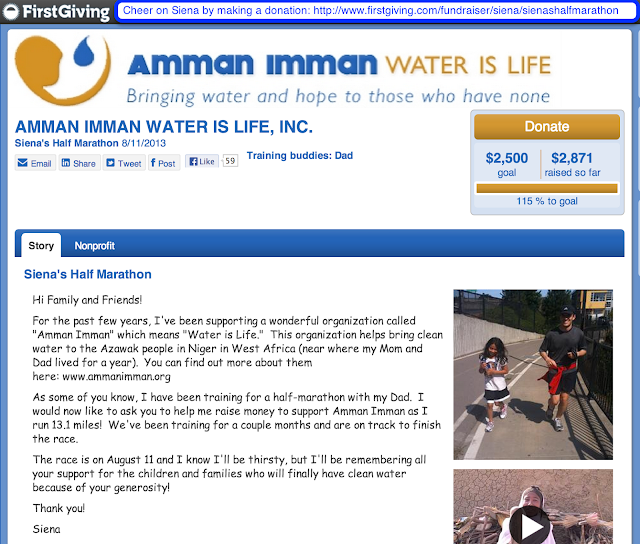 Alongside her dad, she'll be running in the aptly named "Water-to-Wine Half Marathon" in Sonoma County, California. We will be with Siena in spirit, following the race results, as she sets off on her course on Sunday.